That exhaust is probably dangling there because the engineers had no easy way to tuck it in among the other elements without reworking every single one. That makes the exhaust akin to an irksome left over sum after a lot of mathematical procedures have been performed. So, do we think the engineers should have tidied it and tucked it up into the other components or was it a good compromise to leave it as we see it? I feel also that the floor of the car would have had a ridge running down it had the exhaust duct been raised. It has to be either side of that suspension sub-frame and where it is now looks like the wrong side of the sub-frame…. 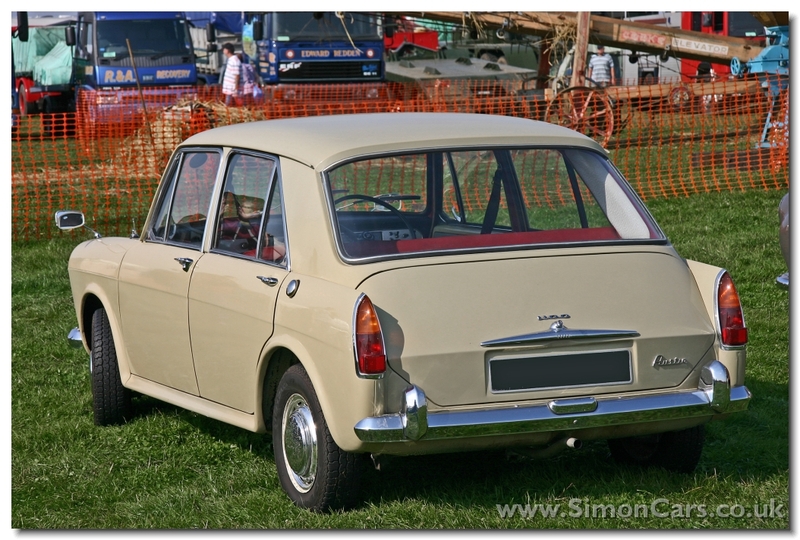 It takes rather a long time to upload these digital photos to WordPress so I have had time to consider the Austin 1100 as never before. These cars were once as common as Golfs are now. We haven’t said a lot about this type of car here and I realised that it is not so easy to discuss (for me, at least). The Austin here is to modern car design what Geoffrey Chaucer is to modern English, or at least what Elizabethan English is in relation to modern English. It is quite tricky for me to assess the form language. I would need to look at the cars from the 1950s more systematically so as to make sense of the elements on the ADO16. However, I can get this far: the round headlamps are a given: all lamps were round in the 1960s and that sets up the wing profiles; the rear lamps are more like a free design decision and fit in with a) the tail end of the tail fin era and b) allow a wider boot and lower bootlid. The glass house shows the standard form of the day regarding angles of the front and rear screen. The boot is vestigial and in line with the C-pillar making this a two-volume car (radical at the time) but verging on the almost rather conventional now. The bonnet line is quite straight as per almost every saloon car of the day. That front screen to bonnet angle is the archetype that radical cars like the Countach blew into the dust. And so we turn to the details, the equivalent of Elizabethan words we don’t use any more like “whereto”, “tidings” and “grammercy”. The grille panel takes up as much space as a grille panel can be expected to and is given character by those undulose chrome bars (undulating forward and rearward with respect to the vehicle’s long axis). The chrome window surround has a quarter light at the front and that little wedge of filler on the rear side of the side glass. Was that styling or a bodge? The car must have been designed by people who had certainly seen but not fully understood the work of other designers (who were in the same position). The fact car designers now can take a step back from their work and see the meta-principles lends a professionalism to their output but also a sameness. Odd as the ADO16 is, it was one among a host of odd cars, created before design became self-conscious. One common feature of Issigonis designs that I have always found perplexing is the height, or rather, the lack of height. Issigonis was obsessed with space efficiency, maximising the proportion of space available to passengers and their luggage, yet he designed cars that were conspicuously lower than any other contemporary saloon cars. Hence, he ignored the “free” space that additional height yields while not increasing the road space occupied by the car. This had implications for usability: I remember watching a tall and rather rotund friend of my father struggle to get in and out of his new MG 1300 and seeing him hunched, round-shouldered over the steering wheel. The low height of the bonnet also had implications for packaging and accessibility of the mechanical ancillaries around the engine. Many knuckles were skinned by professional and amateur mechanics as a result. Incidentally, that exhaust dangling below the car is a very un-issigonis-esque detail, given his obsession with packaging. Regarding the particular example in Richard’s piece above, I can’t Imagine that Issigonis had any input to or interest in the rather frivolous and intricate detail of the “wavy” grille bars. This was most likely to be a function of the attempt to differentiate it visually from its Morris first-cousin. One detail I hadn’t noticed before is the meanness of the rear bumper which, unlike the front, doesn’t wrap around the sides of the car at all . One aspect of the body engineering that I find intriguing is the construction of the front wings. They appear to be made up of two separate parts, with a horizontal seam along the bodyside crease. That seam between wing and front panel looks oddly placed. It would have been much less conspicuous beneath the headlamp, bisecting the sidelight/indicator unit. A strangely complex construction? Daniel, I am no expert on the subject, but did Issigonis not have great success with his home built racing/hill-climb car of low height and light weight? Low c of g = better roadholding = greater safety seemed to be his thought process. It seemed to rather take him by surprise that people actually exploited this for greater performance in the Mini Cooper era. I think the wing might be made of one part if this picture is correct. I was looking at other cars he designed and they often seem to have a crease or chrome strip running along this area. 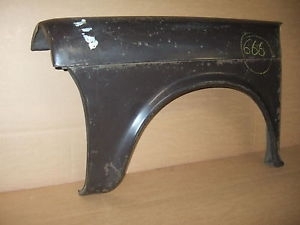 I think that front wing may have been bought by the Devil himself judging by the number inscribed on it. Well done, Mr Gatewood. You actually got it at try number one for all intents and purposes. I think Richard will agree, the Hydrolastic fluid pipes on his subject photo emerge at the front end of the displacer units, while the lovely diagram shows them emerging from the rear. Put me right off the scent. That diagram was purloined by at least one website and misattributed to the Mini in an article on the Metro that I linked to in a comment. In the byzantine world of BMC engineering changes, one forgets the existence of Mk II updates, a common practice. The change to the displacers was obviously one. What were the others? Answers on a postcard, please, to the Department of Trivia. I suspect the instrument panel which looks suspiciously like the one on the 1800 my father owned. Making a decent place for the exhaust to run rather than let it hang low was no doubt far too expensive to contemplate. So far as the styling goes I always thought the 1100 was quite pretty and the treatment at the rear beat all of the other Issigonis two-box originals and follow-ons by a good margin. Whenever I visualize an 1100, the neat rear treatment from C-pillar back is what pops into my mind. They never outdid it. Bill, the hose or pipe you see at the front of the subframe as mounted in the car is probably the hydraulic brake flex hose between the rigid floorpan pipes of the car and the rubber insulated subframe and pivoting suspension arm. The Hydrolastic hose as shown on the “illustration” coming out the back is correct, they were flexible up to the point of attachment to a floor pan mounted rigid pipe. The underside photo is difficult to decipher as there would be Handbrake sleeved cables plus Hydraulic brake hose’s near the trailing arm pivot. There seems to be a different fitting on the right probably an aftermarket fitting as it doesn’t match the left side, believe these are the brake pipe/hoses. Ilike the wheelarches flowing into the rocker panel in one piece. It looks streamlined and modern for the time I think. Looks to me as though it was made in two parts, even if sold as one. Thanks for the upload Daniel. I see what you mean now, they’re lokk welded. This is one of my childhood cars – we had two; a late blue 1300 (the family car) and an earlier red one (used by my stepfather to get him to Stanmore tube station every day). The red one was more interesting to me as it had the red strip speedo like the one in Richard’s pictures. Given my actual Dad always had Cortinas during that period, although I was of a relatively tender age, I used to sit in these cars and mentally note the differences between the two. Obviously, this was not a fair comparison as the Cortina (Mk3) was from the class above the 1300, but, hey this was about Dad’s car vs. Step-Dad’s car! Anyway, we won’t go any further down that particular therapist’s rabbit hole … back to the 1300. I always thought these were good little cars (if you see one today, you realise how diminutive they are compared to even a Polo). They were very spacious (similar to the Cortina, actually, only the boot was a bit smaller). Reasonably speedy. Comfortable to an extent – the rear seat was a bit bench-like. But, it was quite noisy and had that distinctive ‘A’ Series, gear in the sump whine to it. It also felt rather lightweight and insubstantial. The styling never really bothered me, except that I always thought it a bit ‘gothic’ (OK, I’ll be more specific, for some reason it always reminded me of the architecture of our local church – I think it was those rear fins and the shape of the rear lights). Put another way, it looks a bit old-fashioned. The red 1300 died after a minor accident with another car (no one was hurt, but it caused the car to ‘crab’ and so it became a write-off). The blue car stayed with us for a number of years, to the extent that my 3-year older sister learned to drive in it. It was replaced in our household in the mid-eighties by a Maxi 1500 in the same hue of blue, which is the car I learned to drive in … which was quite horrid to drive, even though it was a marvel of packaging. Dad moved on to Montegos (Sierras were ruled out by his company as the insurance on them went through the roof at a given point that I have never really understood) and then a Honda Accord (the twin of the Rover 600) before a stroke meant he was not allowed to drive any more. There was really no way I could have missed identifying this for at the age of 20 in 1962 I became besotted by an Autocar intro of the 1100 showing cutaways and all details. In case anyone thinks this a bit sad for a twenty year old I owned a TR3 at the time but was very much interested in design / engineering and packaging not the oversized extravagant American cars I had grown up with. 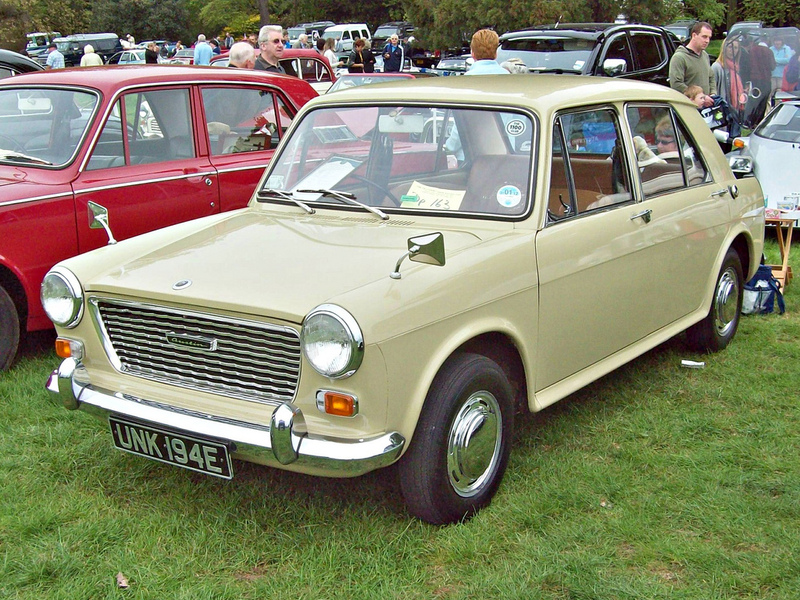 I would go on to buy in Florida one of the last new Austin 1100’s in 67 before it became the “Austin America”, drive it the length of the U.S before shipping to Greece where it served without fail. As there was no immediate acknowledgement that my remark was correct I began to doubt my memory and began to look at all related designs that came along later to make a few wrong suggestions. Seeing the above pics I still like the shape and size. Well, that was the road less travelled in the US in 1962 and subsequently, I’d say! Finding Autocar at a magazine stand in my rural town in Canada was impossible. Hot Rod and Popular Science was it. However, my aunt back in the UK, a car nut like my Mum but more into racing, every single week posted me Motoring News, occasionally Autosport, and once a year the Motor Annual Road Test compendium. Only 6 weeks by seamail at the Commonwealth postal rate: a penny halfpenny. I pretty much memorized the content. Knowledge was power! Well, it would have been if anyone else had cared about the Monte Carlo Rally and Formula One. At university two years later, that changed – there were car nuts and actual rallies and Car and Driver. Shipping your 1100 to Greece? Why would one do that? If it’s not indiscreet to inquire. Bill… career air force move and the previously mentioned elsewhere return to the U.S was by a Peugeot 504. This was the start of a long interesting career and ownership of 150 plus interesting motor cars, those early mags were to blame! Hi Bill, I agree about the treatment of the tail, which is very pleasing, especially in Mk2 form with the smoother tail lights that more closely follow the slope of the C-pillar. The inset chrome triangle in the rear door quarter-light that Richard mentions is, I think, designed to mirror a similar item in the front door, where it facilitates the articulation of the opening front quarter-light. It’s amazing that BMC never offered this as standard and even more astonishing that the successor Allegro model had a “conventional” boot when hatchbacks were the norm on two-box cars in this class. *BMC did, of course, produce a barely larger ADO16 “estate” in two-door form only, which was, effectively, a hatchback. Crawford…. would that be Crayford? An interesting article and posts about a significant car (range of cars, I should say). 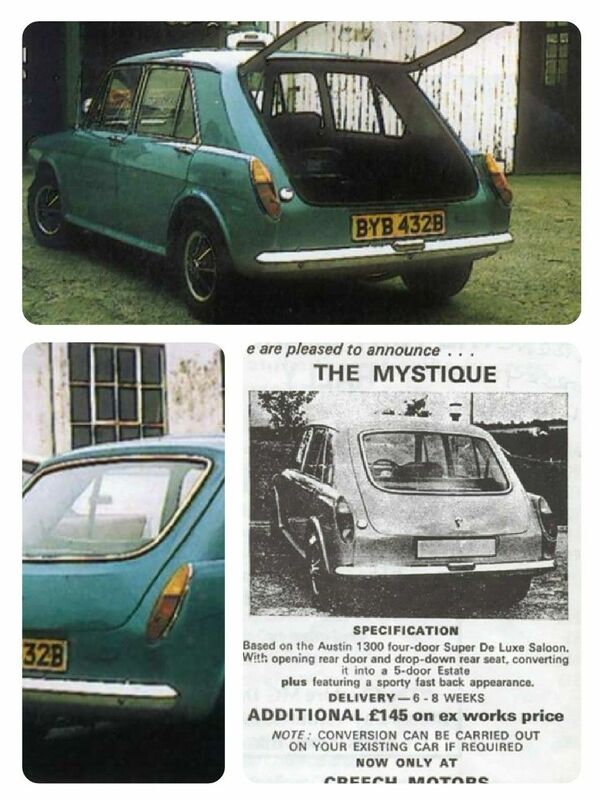 There’s a tonne of information about it on AROnline, of course, which I won’t repeat here, including its similarity to the Autobianchi Primula, which was launched later. Re the chrome window trim; that appeared on some models and not others – odd. I thought it could be there to hide a window latch – probably not. I wonder if the exhaust was positioned where it was for ease of replacement. I recall that exhausts needed to changed much more frequently, back then. Finally, I can’t resist posting a link to one of the many UK public information films which used these cars – reasonably enough, given their popularity at the time and for years afterwards. I saw one of these vehicles on the road, a couple of years ago; it was black and in good condition. It didn’t look weird or out of place, which is a tribute to the design. My father beat Basil by almost a decade with that 1800 of his. Annoyed doesn’t begin to describe his feelings and in four years it was a total rustbucket, Rotodipped body notwithstanding. It just would not start in winter at less than -12C. A single SU on the 1800, twin SUs on my Mum’s Volvo which never ever didn’t start first time. Dad had traded his 92,000 mile Ford Consul that gave him no trouble at all for that ruinously awful 1800. No wonder there were two types of people when I went back to England in 1969; BMC owners and everyone else to whom random bits falling off or not working on their cars was rare. Except your 1100 of course, sir. DGatewod – ah yes, of course – and the car’s also in the film ‘Clockwise’, which stars John Cleese; I think its use may have been a deliberate reference to the Fawlty Towers episode. They’re also good cars to pass your test in, apparently. If I remember correctly one of the mist astonishing engineering features of ADO16 was its exceptional torsional rigidity due to an unusually stiff body shell. That makes it all the more astonishing that its successor was so inadequate in that particular point. Thanks for posting, Richard. That advertisement is a fascinating time-piece from a much more self-confident era for Great Britain. It must also have been quite a challenge to make in the pre CGI era. I agree Daniel – the confidence and innovation it encapsulates is from a distant past. Mind you, “it can’t bounce, it can’t roll, it can’t pitch” probably wouldn’t pass advertising standards today. But it was a short period in history when the future of Britain’s car manufacturers seemed assured.